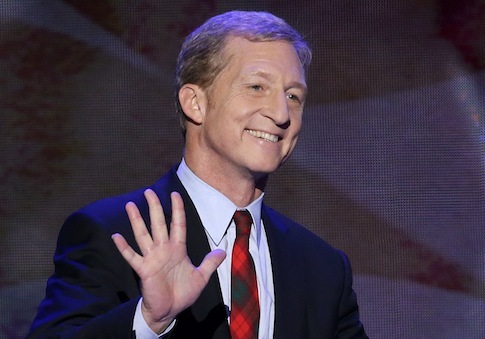 Billionaire environmental activist Tom Steyer said on Thursday that the millions of dollars he is devoting to stopping the Keystone Pipeline have nothing to do with the financial gains he could enjoy if the pipeline is not approved. Steyer has poured money into the special election for U.S. Senate in Massachusetts in the hope of electing a senator who opposes the pipeline. He said those efforts are rooted in a policy vision, not financial self-interest. "I don’t honestly think about this in terms of money," Steyer said at a Thursday press conference in Washington. "From my point of view, I quit my job to try and push to have sensible energy and climate policies in the United States." Steyer noted on Thursday that he resigned last year from Farallon Capital, where he oversaw the firm’s investment activities as a senior partner. He remains an outside limited partner, and the "bulk of his capital" remains with Farallon. Farallon is a major investor in at least one company that will directly compete for business with TransCanada, the company behind the Keystone pipeline, if the pipeline is approved. Farallon owns more than $114 million of stock in the company Kinder Morgan, which is currently spending billions to expand its Trans-Mountain Pipeline System, which transports oil from Alberta, Canada, to the American west coast. Keystone would provide an alternative means to transport oil from Canada to the United States, potentially reducing Kinder Morgan’s market share and boosting a direct competitor for oil transportation deals. As Canadian Business noted, delays in approval of the Keystone pipeline have fueled speculation that "Canada’s two leading pipeline companies will lose out to American rivals" such as Kinder Morgan. Steyer pledged to continue spending money in opposition to the pipeline. "I don’t think it’s going to be that expensive, honestly, but I genuinely don’t know how much that’s going to cost," he admitted. Steyer has contributed $2.5 million to, a Super PAC called the NextGen Committee, which has spent money exclusively in an attempt to elect Rep. Ed Markey (D., Mass. ), a strident environmentalist and outspoken Keystone opponent, to the Senate. Recent polls have consistently shown that sizable majorities of Americans want the pipeline to be approved. While NextGen has spent significant sums on more traditional campaign activities supporting Markey’s candidacy (despite the congressman’s stated opposition to third-party political groups), it shifted its focus recently to what an internal memo called "guerilla marketing." The goal, the memo said, is to "[use] digital and online tools to target persuasion voters." Steyer vaguely alluded to that strategy on Thursday, saying he is working on "certain backbone issues that have to do with social media." He said he’s not sure how much that will cost, but "to me this doesn’t seem to be a question about money." Steyer has previously made similar statements about his activism. This entry was posted in National Security and tagged Congress, Keystone, Progressive Movement, Tom Steyer. Bookmark the permalink.